© 2002, © 2018 by Paul Freeman. Revised 10/14/18. 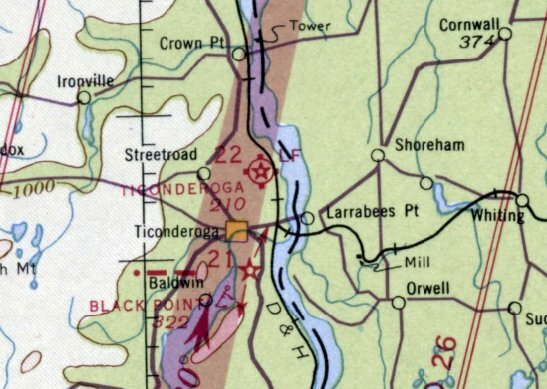 Ticonderoga Intermediate Field, as depicted on the September 1940 Albany Sectional Chart. 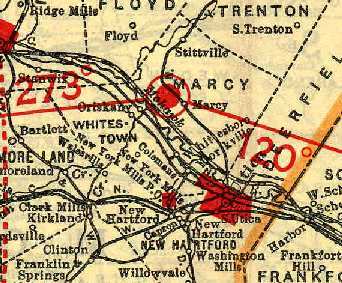 nor depicted on the January 1940 Albany Sectional Chart. was on the September 1940 Albany Sectional Chart. It depicted Ticonderoga as Site 22 along the Commerce Department Airway. 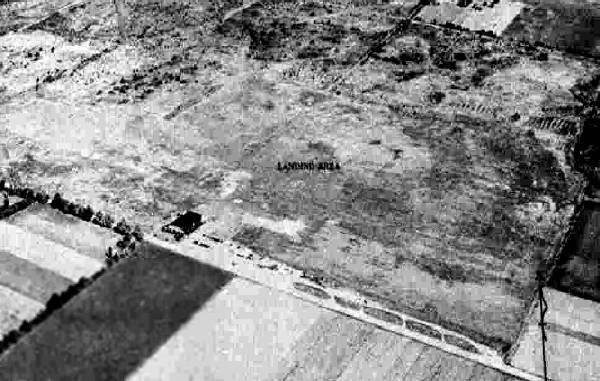 was an 8/26/42 aerial view looking north from the 1945 AAF Airfield Directory (courtesy of Ernie Tobin). and some small buildings northeast of the runway intersection. and depicted on the 1944 & 1945 Albany Sectional Charts (according to Ernie Tobin). measuring 3,200' west-northwest/east-southeast & 2,900' north-northwest/south-southeast. The field was said to have 2 wood & metal hangars, the largest being 40' x 25'. Ticonderoga was described as being operated by the Civil Aeronautics Administration & owned by private interests. 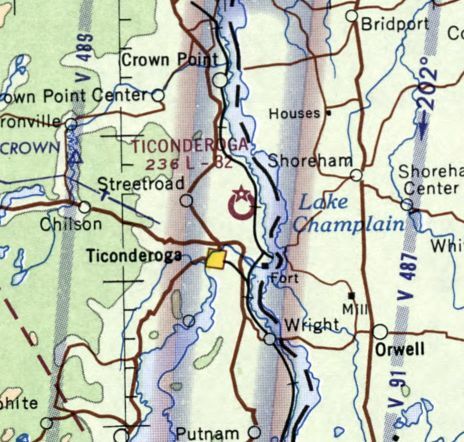 The May 1945 Albany Sectional Chart depicted Ticonderoga Airport as also having CAA Airway Beacon #22. 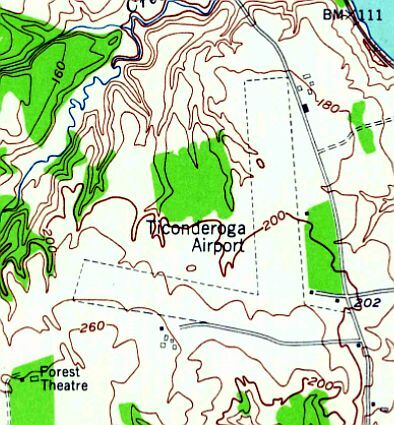 Ticonderoga Intermediate Field was listed in the 1947 Haire Airport Directory (according to Ernie Tobin). 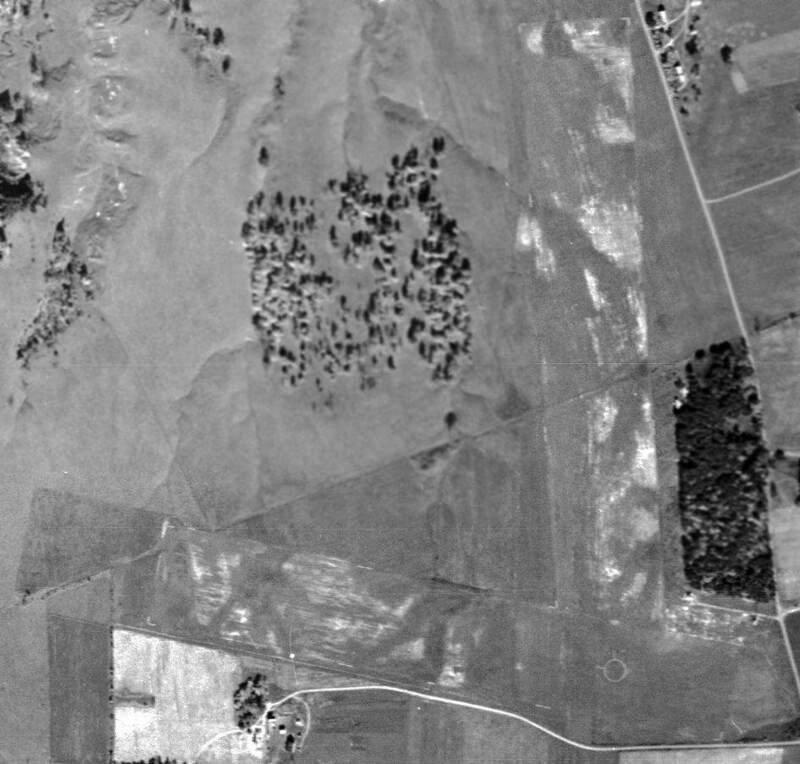 A 1947 aerial photo depicted Ticonderoga in the same manner as the 1942 photo. and was depicted on the 1949 Albany Sectional Chart (according to Ernie Tobin). 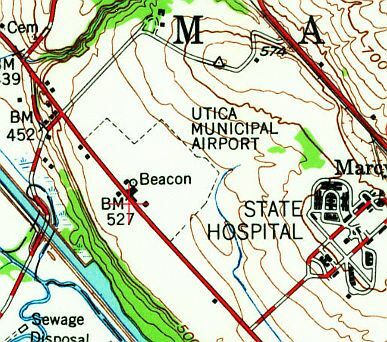 The 1950 USGS topo map depicted Ticonderoga Airport as having 2 unpaved runways & 2 small buildings northeast of the runway intersection. 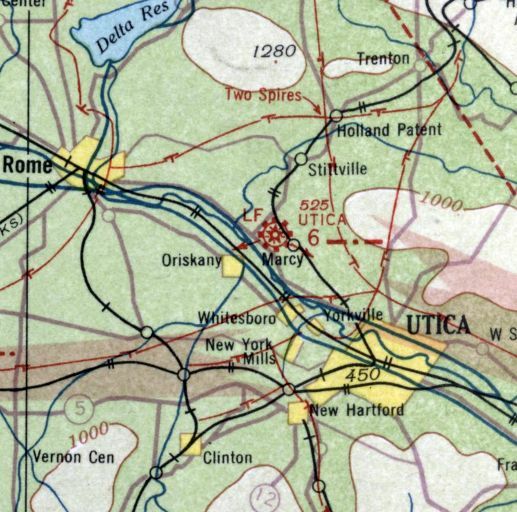 was on the July 1965 Albany Sectional Chart. 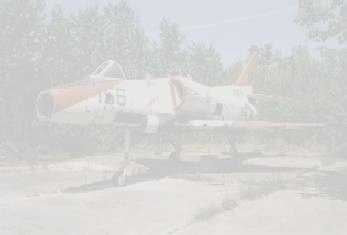 It depicted Ticonderoga Airport as having a 3,200' unpaved runway. 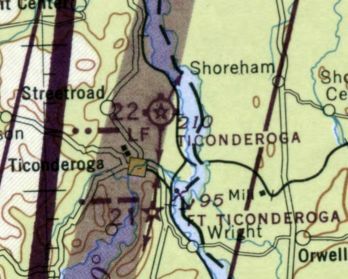 No airport in Ticonderoga was depicted on the February 1970 Albany Sectional Chart. 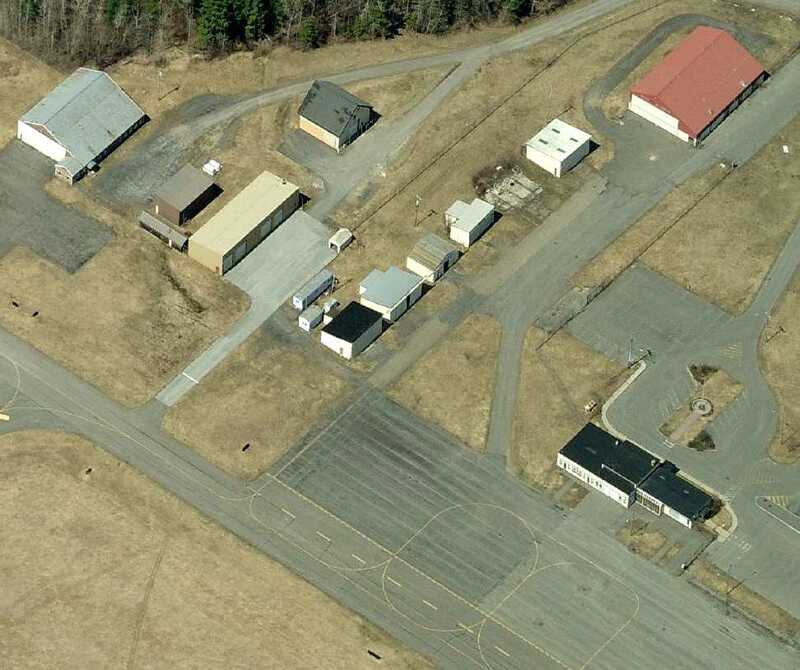 The new Ticonderoga Municipal Airport opened just a mile to the southeast in October 1978, with a paved runway. through the center of the original Ticonderoga Airport property at some point between the 1960s-1994. A 10/8/11 aerial view showed the faintest traces of the outline of the 2 Ticonderoga grass runways. 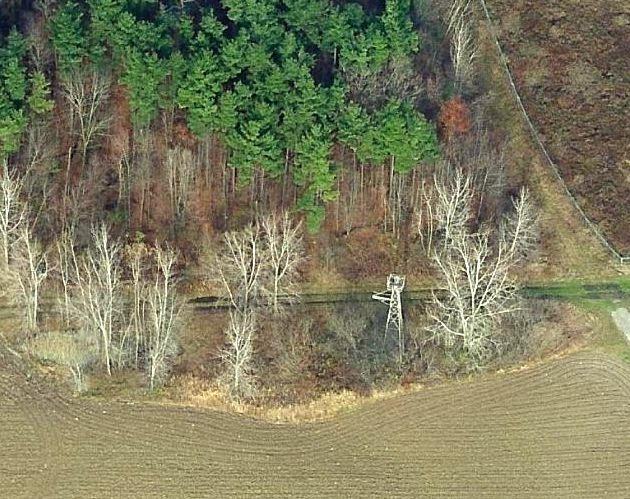 A circa 2010 aerial view looking north at the historic circa 1942 airport beacon on the east side of the site of Ticonderoga Intermediate Field. Ernie Tobin observed in 2013, “The only thing remaining on site is the old beacon light, but pieces of the old grass runways can still be seen from the air. The beacon is one of my aviation causes. A circa 1943-45 aerial view looking north at Plattsburgh Municipal Airport, from the 1945 AAF Airfield Directory (courtesy of Scott Murdock). 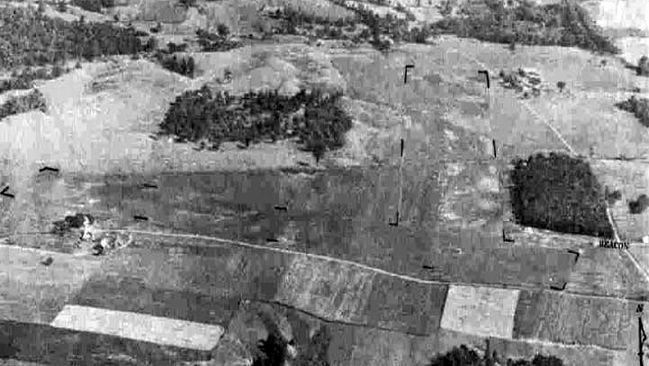 No airfield was yet depicted at this location on the 1943 USGS topo map. 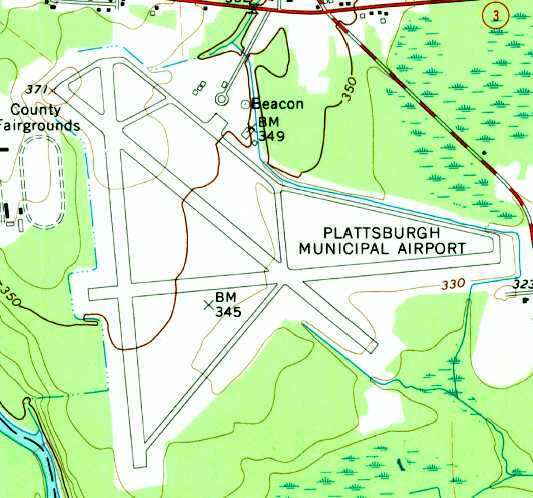 According to its FAA Airport/Facility Directory data, Plattsburgh Municipal Airport / Clinton County Airport was established in 1943. It depicted the field as having 3 paved runways, taxiways, and a ramp on the north side. 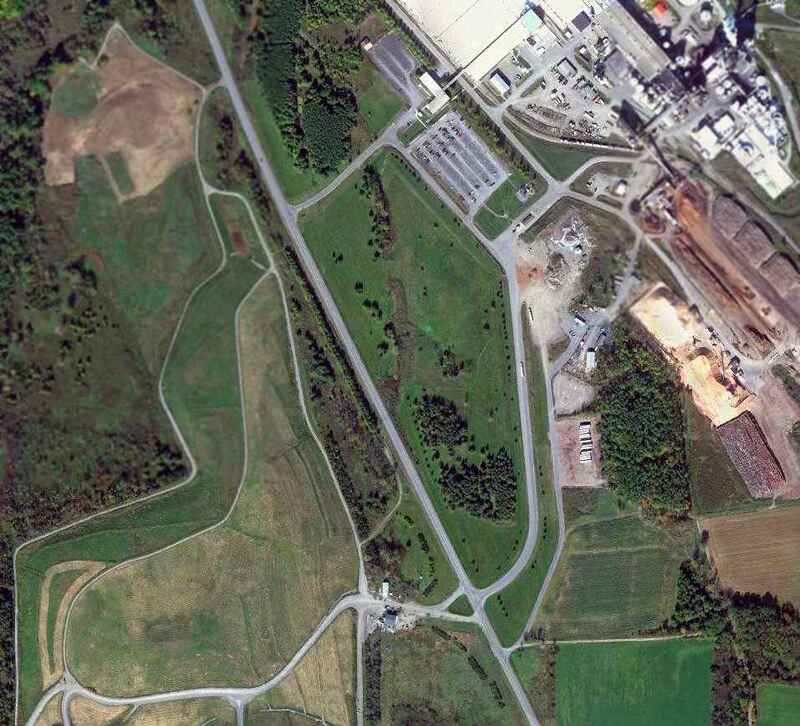 as a 1,120 acre irregularly-shaped property having 3 asphalt 5,000 runways. and to be owned by the City of Plattsburgh. showed the field to have 3 paved runways, taxiways, and 2 small buildings on the north side. 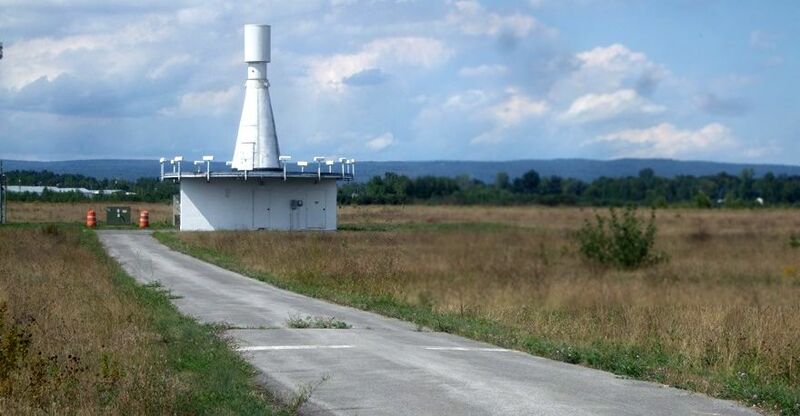 and a small ramp with several small buildings & a beacon on the north side. was on the April 1964 Burlington Sectional Chart. 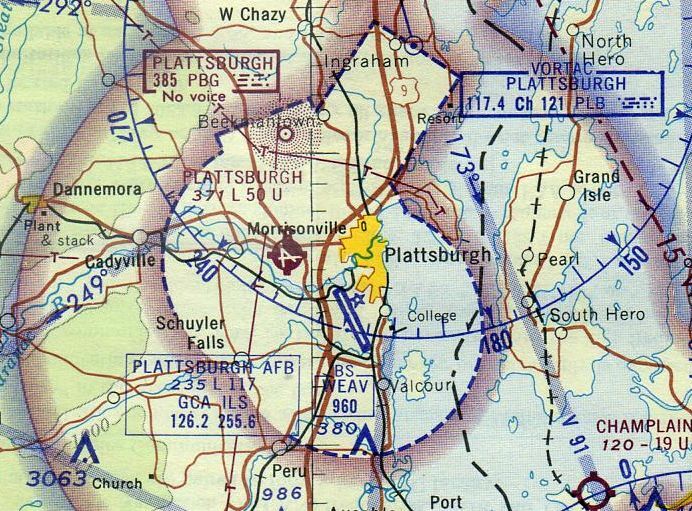 It depicted Plattsburgh as having a 5,000' runway. 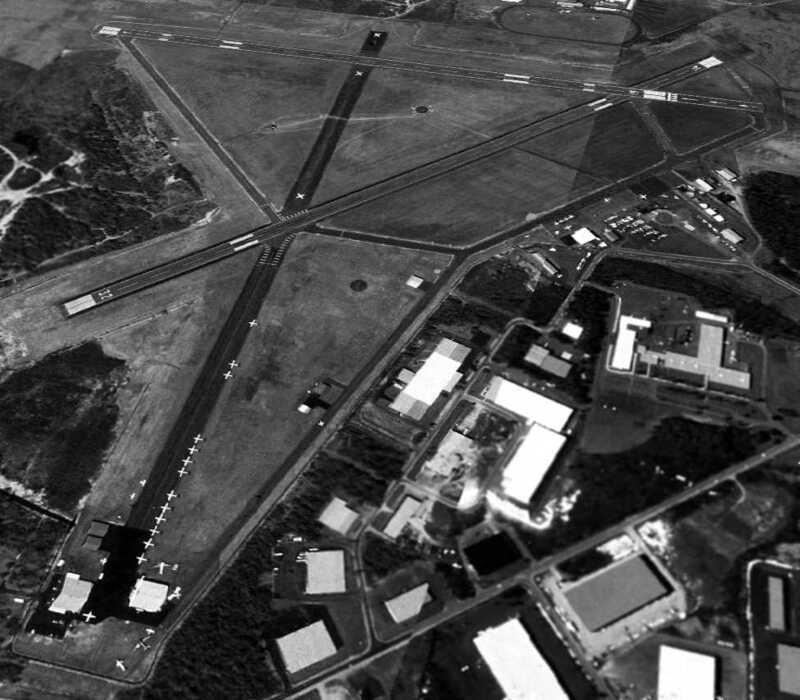 A 4/19/64 USGS aerial view of Plattsburgh Municipal Airport. 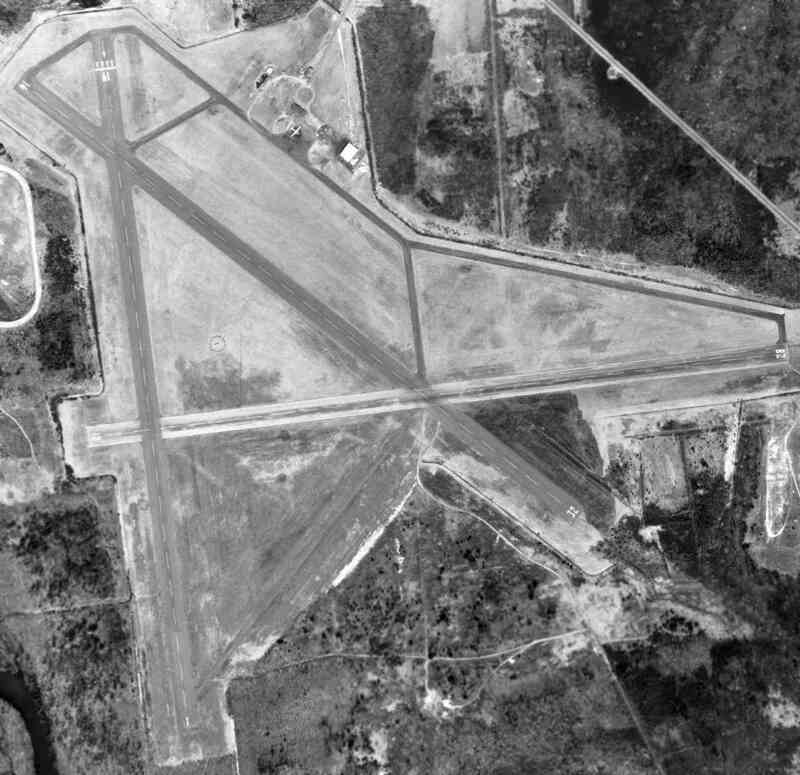 A closeup from the 4/19/64 USGS aerial photo depicted 7 aircraft on Plattsburgh's north ramp, including 6 single-engine aircraft & 1 larger twin-engine airliner (a Convair?). 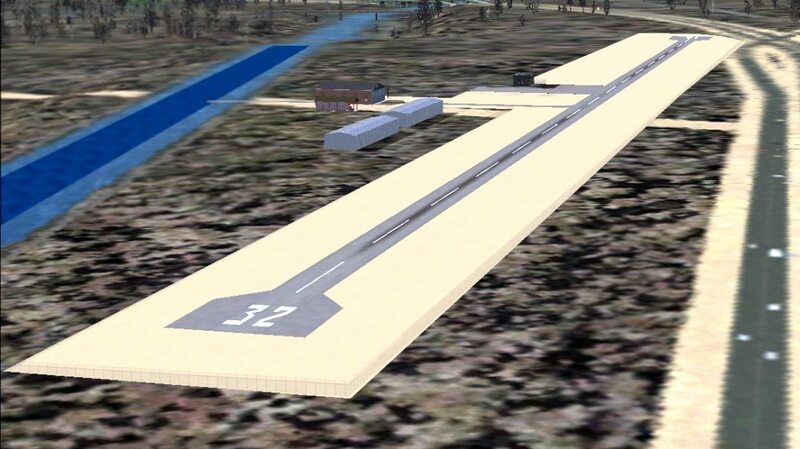 depicted Plattsburgh Municipal Airport as having 3 paved runways, with the longest being 5,000'. after mistakenly landing at the relatively small civilian airport after mistaking it for the nearby Plattsburgh AFB. 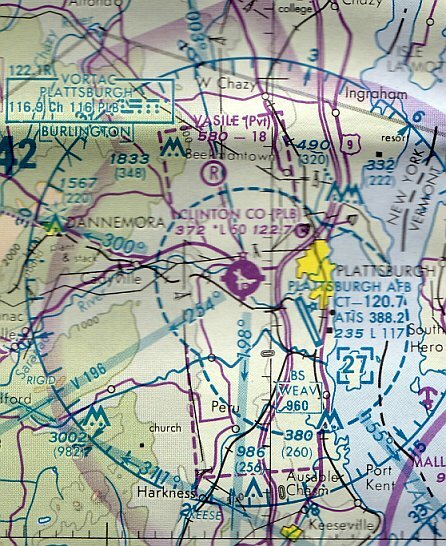 H. Van Acker recalled, “[I] took most of my lessons at Flying Nunn's Aviation located at the former county airport, less than a mile west of the base [Plattsburgh AFB]. 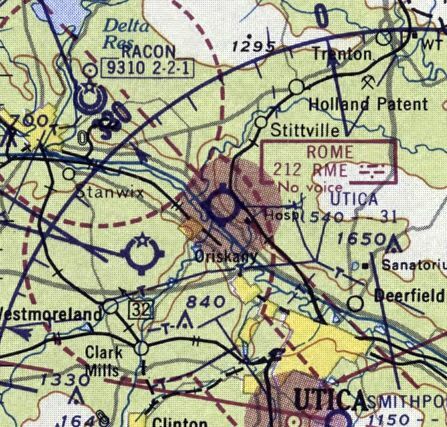 The last aeronautical chart depiction which has been located of Clinton County Airport was on the 1994 Montreal Sectional Chart. 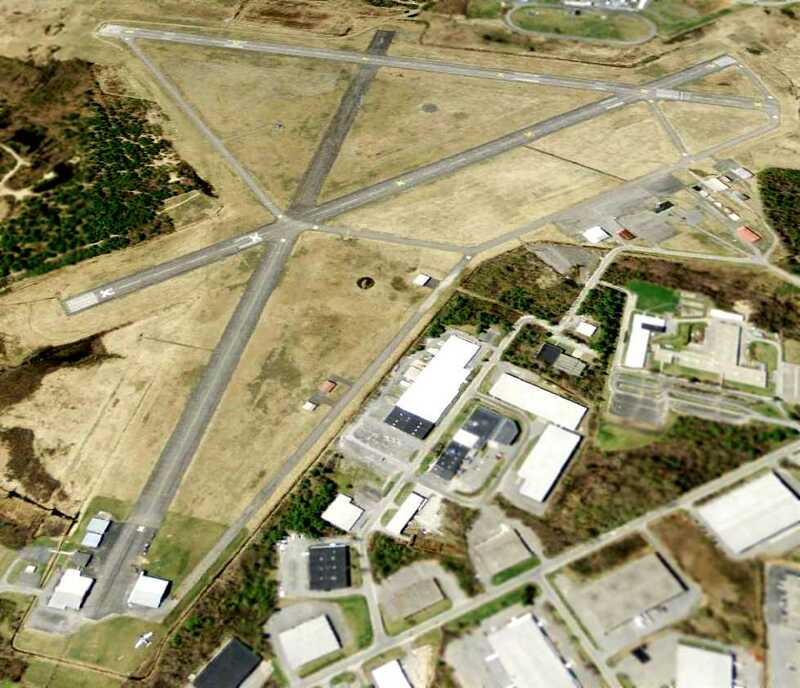 It depicted Clinton County Airport as having 3 paved runways, with the longest being 5,000'. including at least 2 vintage DC-3s among the many aircraft parked at the lower-left at the end of the former Runway 27. A 6/20/96 photo of N736SL (a 1977 Cessna R172K Hawk XP, C/N: R1722752) & a Grumman Goose amphibian at Clinton County Airport. A 7/7/06 photo of a 1940s DC-3 departing from Clinton County Airport. as having 2 paved runways, with the former Runway 9/27 being closed. and conducting an average of 39 takeoffs or landings per day. The manager was listed as Rodney Brown. 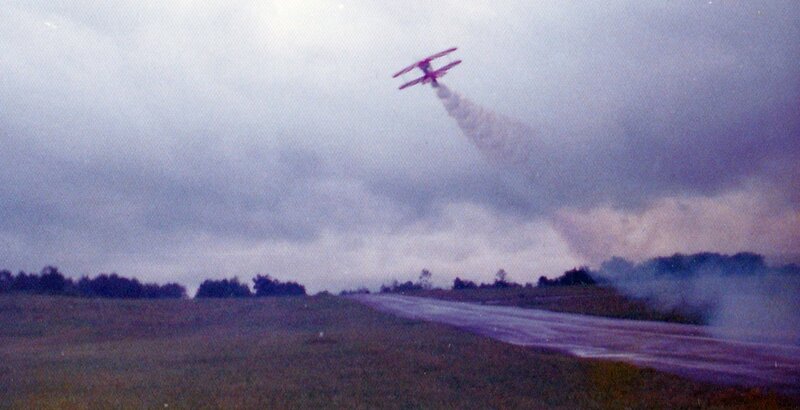 and Clinton County Airport was closed to itinerant aircraft, though it continued to be used for paradrops, and a few aircraft were still based there. showing a wingless DC-3 fuselage & the cockpit of a larger aircraft, which appear to be the last aircraft remaining at the former Clinton County Airport. 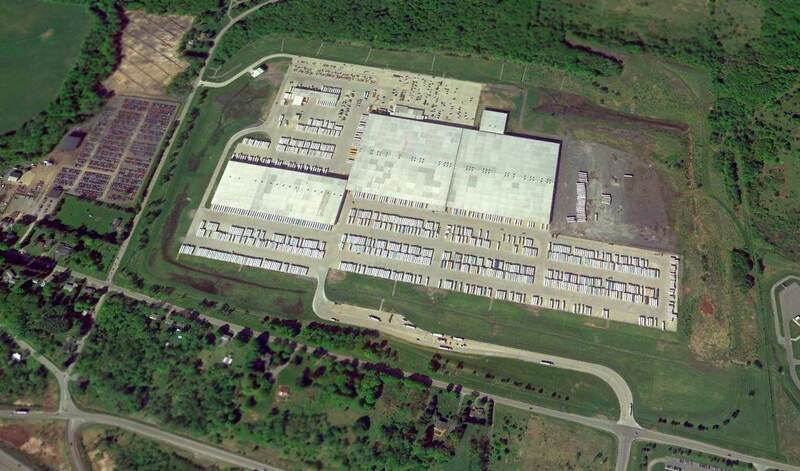 A circa 2007-2011 aerial view looking north at the hangars on the north side of the former Clinton County Airport. a vintage DC-3 at the bottom-left. a retired Federal Express 727 which was brought into the field to be donated to the Plattsburgh Aeronautical Institute. 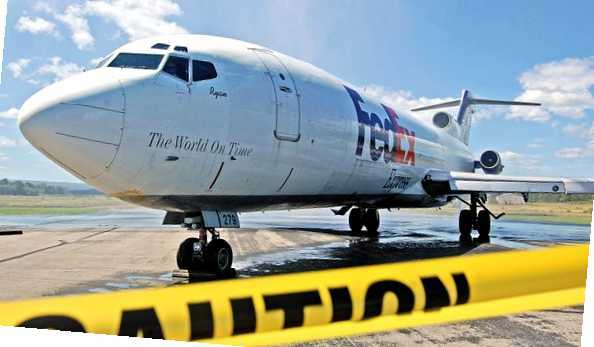 “A FedEx Boeing 727 made what might be the last landing at the former Clinton County Airport. A gift to Plattsburgh Aeronautical Institute, the aircraft first made one approach & fly-over, then circled to the right before making a smooth landing. It taxied to the Aeronautical Institute, where it rolled under a water arch created by 2 water cannons on Morrisonville Fire Department trucks. Jim McCartney III, principal of the CV-TEC satellite campus that houses the institute there & other programs, said that is the traditional way aircraft are retired from service. said FedEx Managing Director of Aircraft Acquisitions & Sales David Sutton. 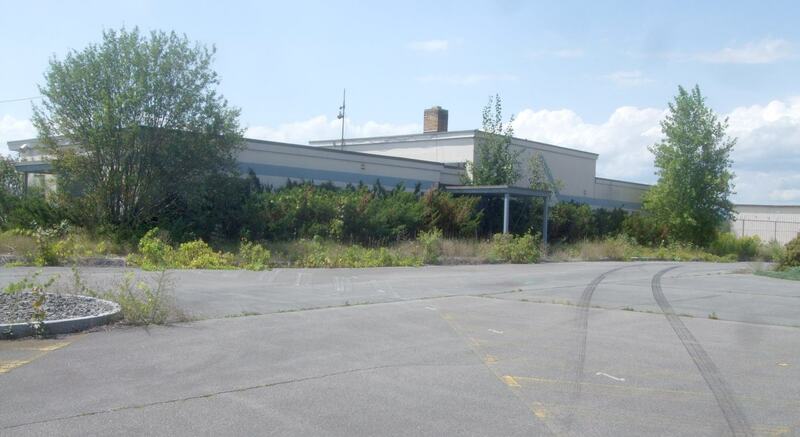 As of 2012, the status of Clinton County Airport was listed as “Closed permanently”. An 8/25/15 photo by Ron Plante looking North along the former Clinton County Airport Runway 1. 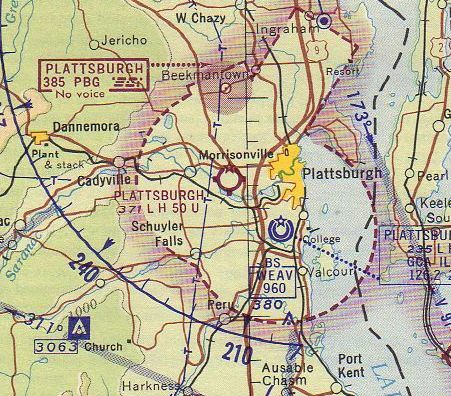 Ron reported, “Except for Plattsburgh Aeronautical Institute (PAI) at the eastern corner, there is zero activity, the runways are unused. Ron reported, “Plattsburgh Aeronautical Institute has numerous aircraft outside and inside, largest is the FedEx 727 N279FE. An 8/25/15 photo by Ron Plante of abandoned hangars & the terminal of the former Clinton County Airport. An 8/25/15 photo by Ron Plante of the entrance to the abandoned Clinton County Airport terminal. An 8/25/15 photo by Ron Plante of the PLB VORTAC at the former Clinton County Airport. The site of Clinton County Airport is located at the southwest terminus of Airport Entrance Road. as depicted on a 1929 "Rand-McNally Standard Map of NY with Air Trails" (courtesy of Chris Kennedy). 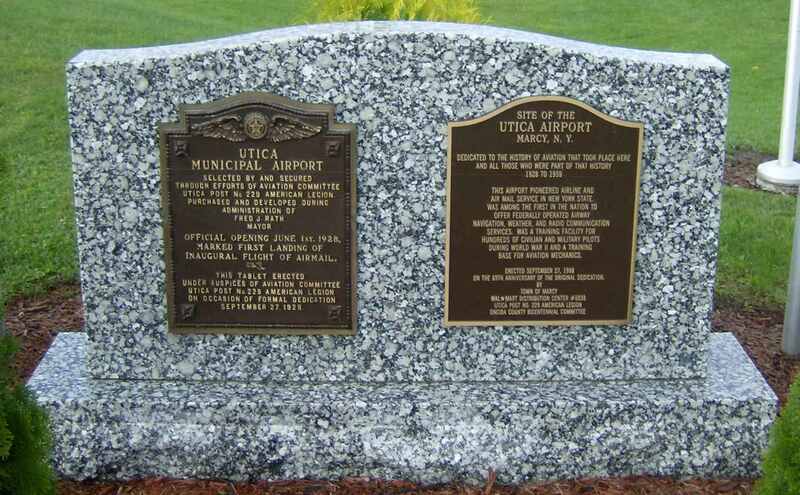 The Utica Municpal Airport was dedicated 6/1/28, according to a historical plaque on the site of the airport. was on a 1929 "Rand-McNally Standard Map of NY with Air Trails" (courtesy of Chris Kennedy). It described Utica Municipal as having a 3,000' x 3,920' field. Presumably, this firm operated from the Utica Airport. 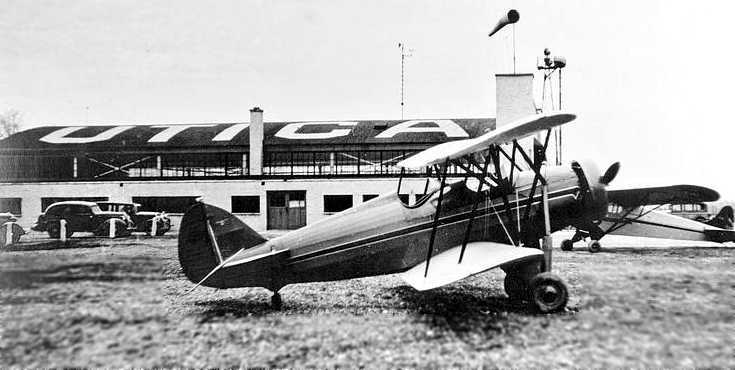 was a 1935 view of a Waco QCF-2 biplane in front of the main hangar with UTICA painted on the roof. Gloria Santucci, one of the area's first woman pilots & the first licensed to carry passengers, was a longtime instructor at Utica Airport. An undated colorized postcard photo depicted a group of biplanes in front of a hangar marked “Utica Municipal Airport”. depicted Utica Municipal Airport as having a single hangar, which had "Utica" painted on the roof. the longest being a 3,300' northwest/southeast strip. 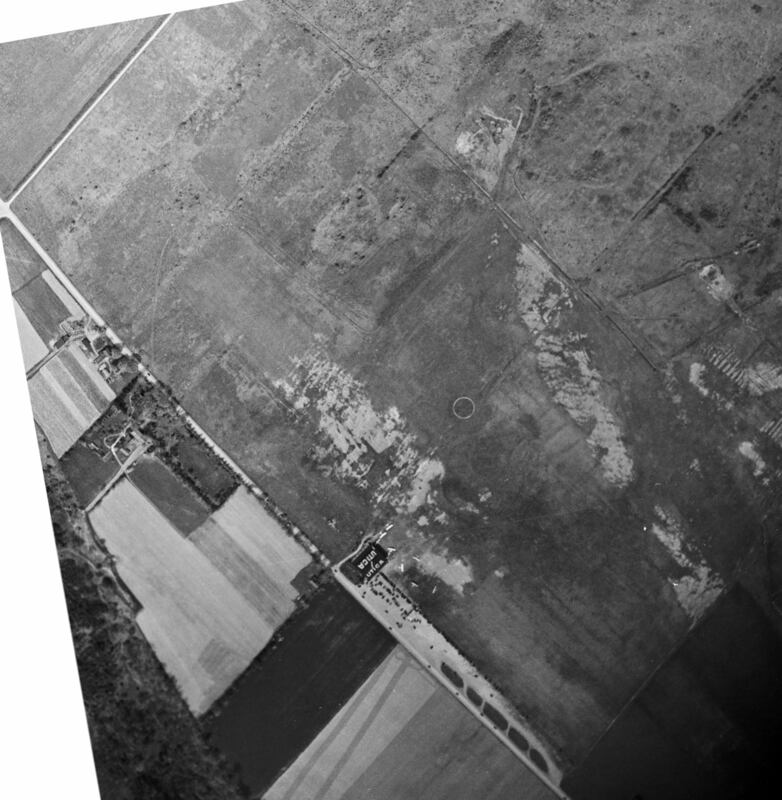 A 5/4/41 USGS aerial view depicted Utica Municipal Airport as having a single hangar, which had "Utica" painted on the roof, on the west side of a grass airfield, with an airport circle marking in the center. A total of 8 light aircraft were seen parked around the hangar. It depicted Utica as an open grass area with a hangar on the south side. as a 355 acre irregularly-shaped property having a sod all-way landing area, with the longest dimension being 3,100' northwest/southeast. The field was said to have 2 hangars, the largest being a 120' square brick structure. 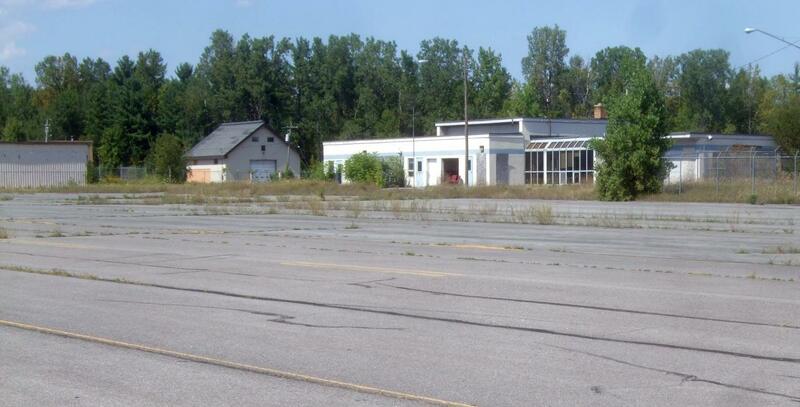 Utica Municipal Airport was described as being owned by the City of Utica & operated by private interests. with several buildings (hangars?) & a beacon depicted along the southwest edge of the property. 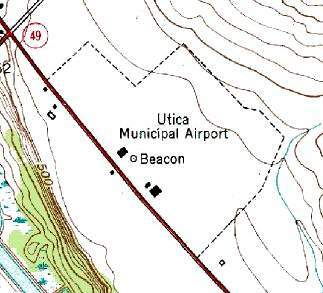 depicted Utica as having a 3,100' unpaved runway. described Utica as having a 3,100' "all-way" turf landing area. 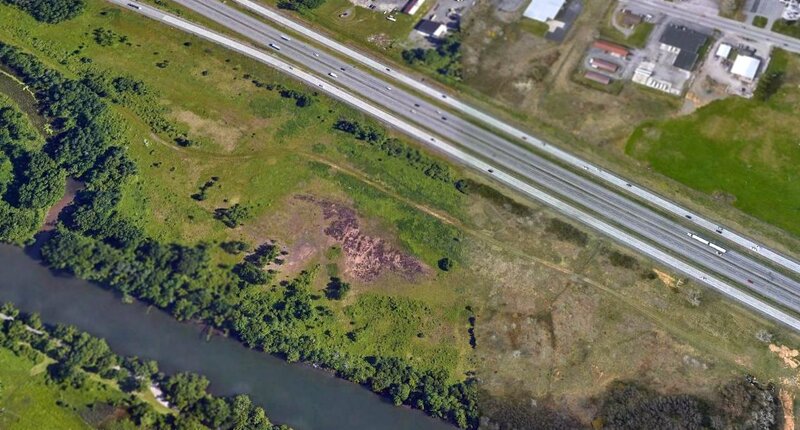 with an outline of the property, several buildings (hangars? ), and a beacon depicted. I took my private pilot flight test there in spring of 1958.
was on the May 1960 Albany Sectional Chart. It described Utica as having a 3,100' unpaved runway. 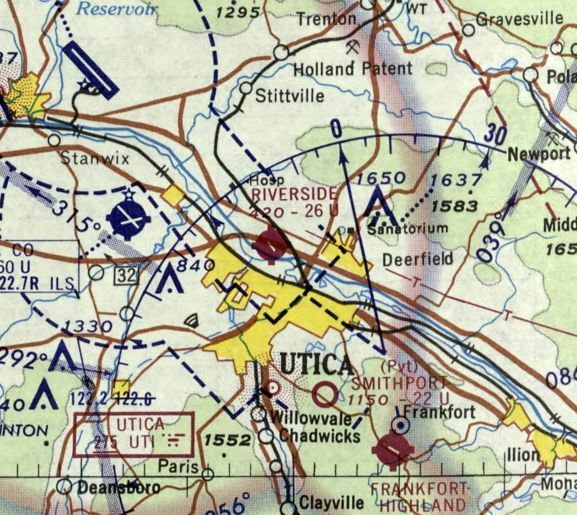 Keith Hunt recalled that the Utica Municipal Airport property was used to fly radio-controlled model aircraft in the 1960s. 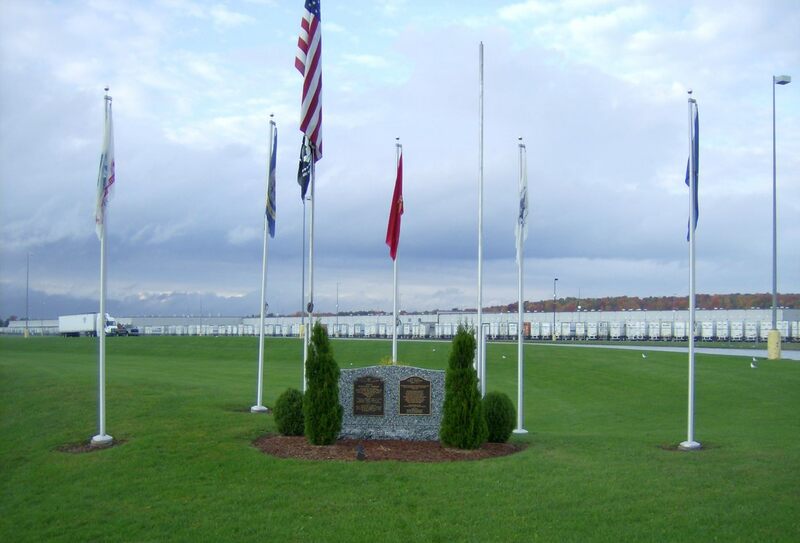 A historical plaque was erected on the site of Utica Municipal Airport in 1993, on the occasion of the 69th anniversary of the airport's dedication. with not a trace of the former airfield remaining. A 2015 aerial view looking northeast shows no trace remaining of the Utica Municipal Airport. A 2015 photo by Andy Frank of a historical plaque on the site of Utica Municipal Airport. A 2015 closeup by Andy Frank of a historical plaque on the site of Utica Municipal Airport. The site of Utica Memorial Airport is located east of the intersection of Old River Road & Chaminade Road, across the Erie Canal from Utica. Riverside Airport, as depicted on the 1967 Albany Sectional Chart (courtesy of Mike Keefe). 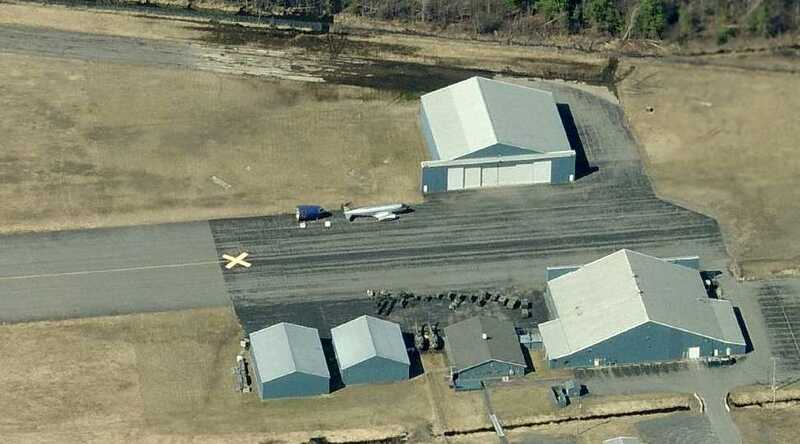 This small general aviation airport was located only 3 miles southeast of the site of the former Utica Municipal Airport. Riverside Airport was apparently built between 1965-66, as it was yet depicted on the July 1965 Albany Sectional Chart. who recalled, “Riverside... I took lessons there when I was 18 . My father flew out of there also. He had his license for years, but studied with me. His name is Leon Lust. He knew the Ground School teacher, Gloria Santucci. My Flight Instructor was Al Waskiewicz. Al or somebody else owned a WWII Navy trainer, an SNJ. It was a nice little airport. The school was accredited, I think, but I'm not sure. They were aiming for that if it was not yet accredited. 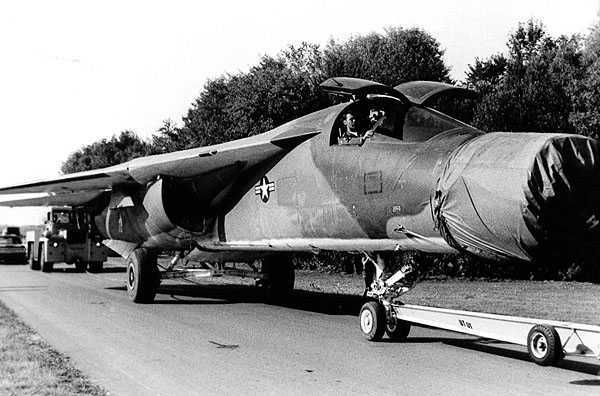 I think it was a one year course in aircraft mechanics. Gloria would get a little riled up & say, 'We'll lose our license if you keep that up!' It was all really fun to listen to! Riverside was a great airport & I'm sure it's missed. One of the men who hung out there used to be a flight instructor. It described Riverside Airport as having a single 2,500' gravel runway. 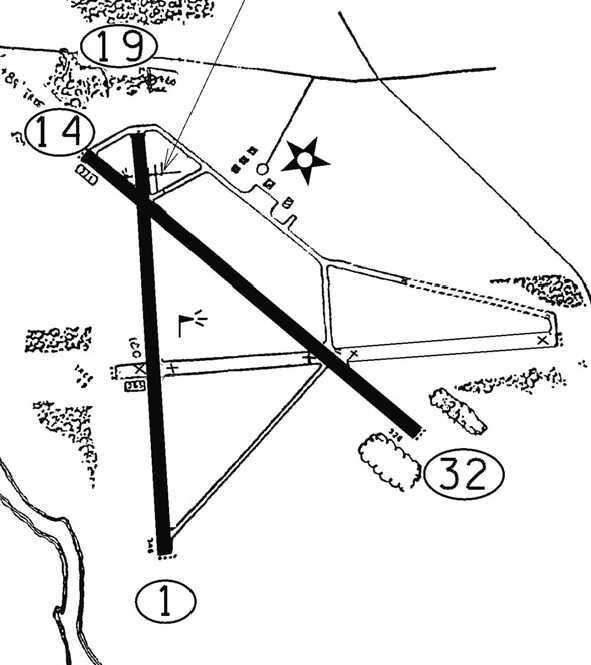 as the February 1970 Albany Sectional depicted it as having a 2,600' paved northwest/southeast runway. Gary Lampman recalled, “I attended the Riverside School of Aeronautics from July 1972 to July 1973, earning my A&P certificate. The school was owned by Gordon Newell, managed by Gloria Santucci, with Pat Malara, Chief Instructor. In those days there were a number of G.I. Bill students returning from the military & classes of 24 each quarter were the norm. Being located at an active airstrip, there was plenty of opportunity to get hands-on experience on light aircraft. Students could get involved in transferring floatplanes back to wheels & vice-versa each season, prepping planes for Powderpuff derby contestants & being able to view a variety of visiting planes. Gordon Newell owned a Grumman Widgeon which several classes were installing a number of upgrades. There was an instructor for each quarter semester who was retired from either airline, corporate or general aviation. The school had 2 hangars, 3 classroom buildings & a wide assortment of engines, mockups & airframes, T-6, BE-18, Stearman, etc. It was an excellent education. 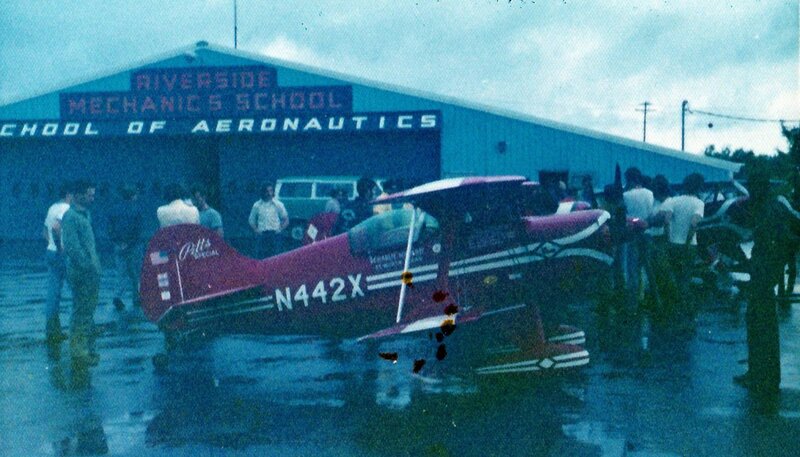 Riverside Airport inherited a number of aircraft from the old Utica Municipal & seemed to attract a variety of visitors. A July 1973 photo by Gary Lampman of the Pitts Specials of the Red Devils aerobatic team parked at the Riverside Airport gas pumps. Gary recalled, “One rainy Friday afternoon there was a visit by the Red Devils aerobatic team ducking out of the weather. Charlie Hilliard, Tom Poberezny & Gene Soucy with their S-1 Pitts Specials had to wait out the weather on way to a Boston airshow. A July 1973 photo by Gary Lampman of Charlie Hilliard's Pitts parked in front of the Riverside Mechanics School of Aeronautics hangar. A July 1973 photo by Gary Lampman of the Pitts Specials of the Red Devils aerobatic team departing from Riverside Airport. Gary observed, “After several hours they were able to leave, but remarked they hope they didn’t have to return to Riverside as the narrow runway disappeared under the nose of the Pitts. 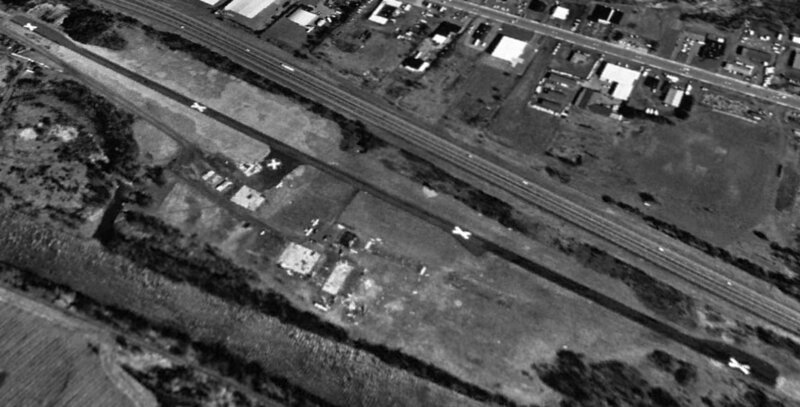 The last photo which has been located showing Riverside Airport while in operation was a 4/1/74 USGS aerial view. 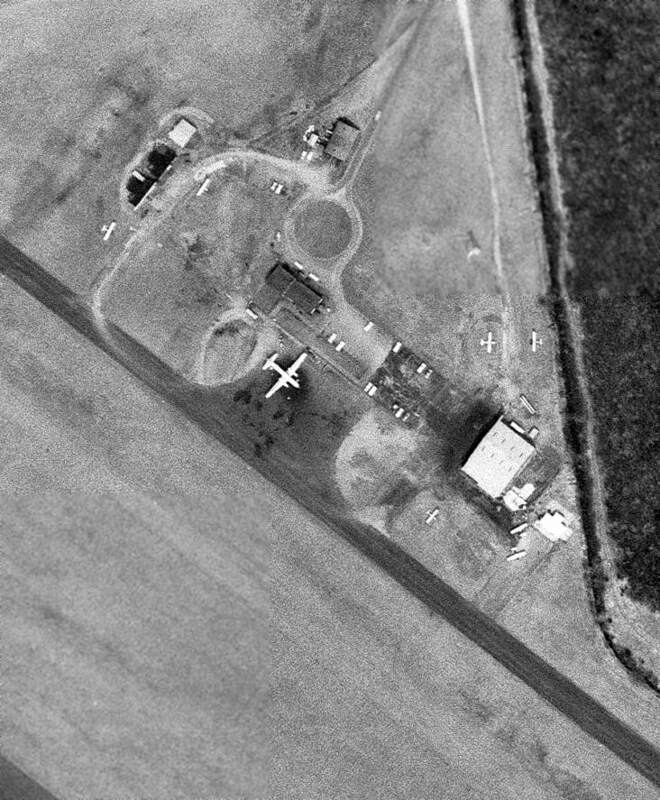 It depicted a few small aircraft parked near the hangars on the south side of the runway. A flight simulator scenery depiction looking west at Riverside Airport. described Riverside Airport as having a single 3,500' asphalt Runway 14/32. 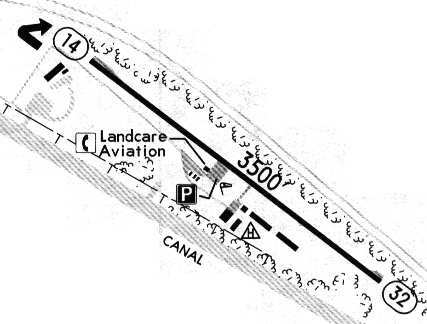 Strangely, Riverside Airport was not depicted at all on the 1985 USGS topo map. it had a aviation mechanics school & lots of stories. It was wedged between the Thruway & the Erie Barge Canal, so the seaplanes could take off. Landcare Aviation, Inc. & Mark's Flight Training. Jonathan Westerling reported, "While closed, the Riverside airport is very much intact. I visited it back in 1997. It is right next to the canal, visible from the Throughway & easily accessible. The land is private, and there were no trespassing signs." although there were still at least 2 light aircraft visible parked on the ramp. 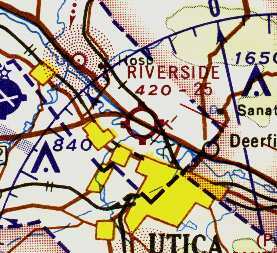 Riverside was still depicted as an abandoned airfield on 2002 aeronautical charts. 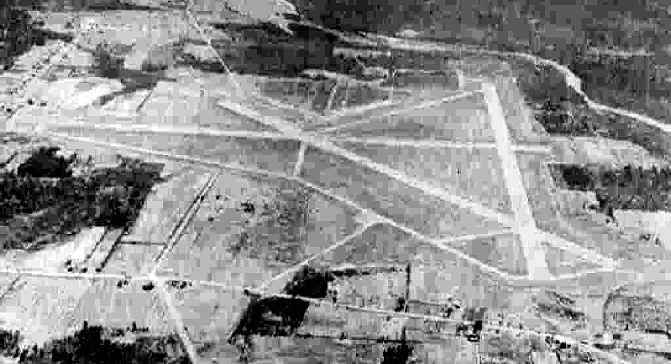 the airport no longer exists - the runways were removed in order to construct major highway interchanges in the area. 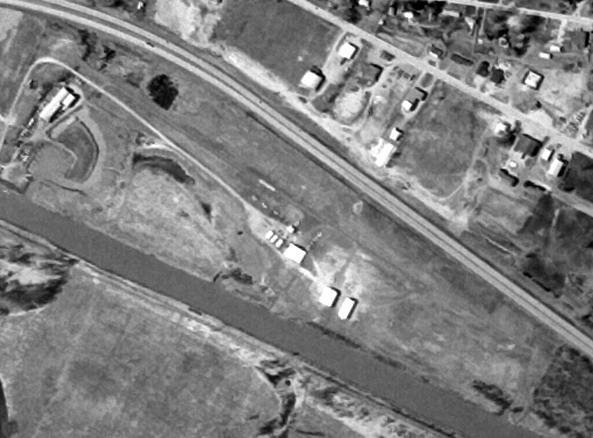 A 2016 aerial view looking north at the site of Riverside Airport showed a dramatic difference compared to the 1997 aerial photo. All of the airport buildings & runway pavement had been removed, with only the slightest traces of the ramp pavement remaining. Another grassroots American airport completely removed from existence. Riverside Airport is located south of Interstate 90 & north of the Erie Canal, northwest of Route 8.